There are skate boarders flying by the window, and it is supposed to be spring but it is still far too cold for my liking! I opened the door to the street today – probably just guaranteed it will snow again! But, it is warm inside and spring releases are flying in the door. Our yearend will be over by 1 April and we will be seriously restocking as we head toward summer. Parry Sound books has had a better winter that we’ve had in many years, and as we head into year 31 I am more optimistic about the book business and the survival of this independent bookstore than I’ve felt in many years. Son of A Trickster by Eden Robinson is now out in paperback. A compelling coming-of-age novel in which everyday teen existence crashes up against Indigenous beliefs. Let Me Lie by Clare Mackintosh is another gripping psychological thriller. Every Note Played by Lisa Genova is the story of a concert pianist facing a diagnosis of ALS. I’ll Keep You Safe by Peter May is a stand-alone mystery set in Paris and the Isle of Lewis. Delivers exactly what we expect from this popular author. The Italian Teacher by Tom Rachman tells the story of the son of a great painter as he strives to create his own legacy. The Friendly Ones by Philip Hensher wins the prize for the most inexplicably odd dust jacket of the year. I loved this absolutely great novel about two families, neighbours in London, with so little – and so much – in common, told over two generations. I cannot figure out what the cover has to do with the story! Donna Leon is back with The Temptation of Forgiveness giving us the gift of just a little time spent in Venice with Commissario Guido Brunetti. 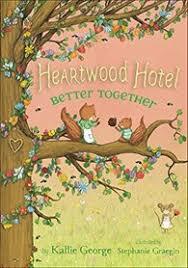 For the little ones at Easter we have lots of picture books and a lovely little series of first chapter books, Heartwood Hotel is now a series of three, featuring lovely little animals who make a home together.